Four County Career Center Skills USA Chapter members are participating in the Ohio State Skills USA Competition in Columbus on April 24 and 25 after taking first, second or third place at regional competition. Skills USA members from all parts of Ohio will be competing for awards and the right to advance to National Skills and Leadership contests. Contest participants from Fulton county are, from left, Mia Beltran (Delta) Crime Scene Investigation; Hunter Allen (Delta) Extemporaneous Speaking; Dylan Duncan (Evergreen) Career Pathways; Andrew Louy (Evergreen) Additive Manufacturing; and Reese Knapp (Archbold) Plumbing. Absent from the photo is Andrew Canada (Pettisville) Internetworking. Four County Career Center Skills USA Advisor is Steve Steingass. 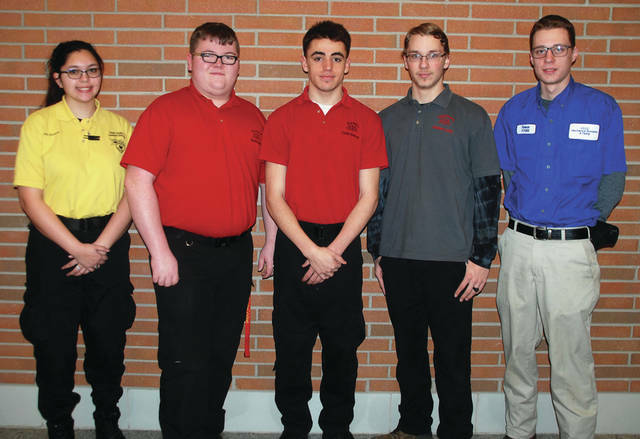 Four County Career Center Skills USA Chapter members are participating in the Ohio State Skills USA Competition in Columbus on April 24 and 25 after taking first, second or third place at regional competition. Skills USA members from all parts of Ohio will be competing for awards and the right to advance to National Skills and Leadership contests. Contest participants from Fulton county are, from left, Mia Beltran (Delta) Crime Scene Investigation; Hunter Allen (Delta) Extemporaneous Speaking; Dylan Duncan (Evergreen) Career Pathways; Andrew Louy (Evergreen) Additive Manufacturing; and Reese Knapp (Archbold) Plumbing. Absent from the photo is Andrew Canada (Pettisville) Internetworking. Four County Career Center Skills USA Advisor is Steve Steingass. https://www.fcnews.org/wp-content/uploads/sites/45/2018/03/web1_2018-skills-usa-fulton.jpgFour County Career Center Skills USA Chapter members are participating in the Ohio State Skills USA Competition in Columbus on April 24 and 25 after taking first, second or third place at regional competition. Skills USA members from all parts of Ohio will be competing for awards and the right to advance to National Skills and Leadership contests. Contest participants from Fulton county are, from left, Mia Beltran (Delta) Crime Scene Investigation; Hunter Allen (Delta) Extemporaneous Speaking; Dylan Duncan (Evergreen) Career Pathways; Andrew Louy (Evergreen) Additive Manufacturing; and Reese Knapp (Archbold) Plumbing. Absent from the photo is Andrew Canada (Pettisville) Internetworking. Four County Career Center Skills USA Advisor is Steve Steingass.